Suitable to extract blood components (plasma, platelets) from collection container Mode of operation: Manual Front panel is spring loaded to uniform pressure on container causing transfer of fluid Compression plate made of transparent acrylic, durable. Easily Transportable from place to place. Chassis Metal used for the equipment is non-corrosive stainless steel and can be cleaned with antiseptics. Base portion and Vertical surface is made to have better strength and long lasting performance. To express blood components from the collection bags The front panel should be spring loaded with parallel acrylic compressor plate. simple, light weight & easy to use. Salient Features: • Stainless steel cabinet withstand corrosion, wear &tear on continuous usage. 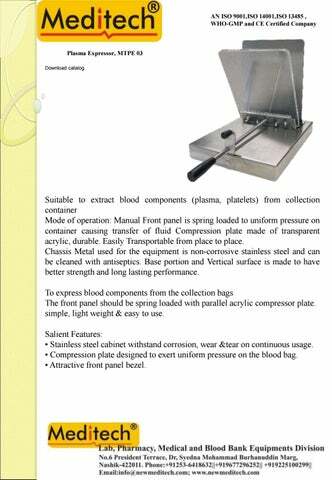 • Compression plate designed to exert uniform pressure on the blood bag. • Attractive front panel bezel.